1996 was a long, long time ago. 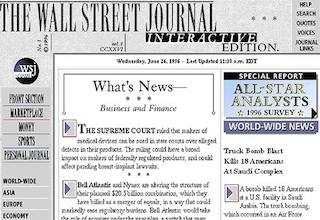 Twenty years ago today, The Wall Street Journal launched its site, wsj.com. The web has changed just slightly since then. While the Journal made waves for charging readers to access online content (what a concept! ), for the first few months after wsj.com made its 1996 debut, the site was entirely free. That was an intentional move, explained Journal editor for specialized news products and events Dave Pettit.